I was wondering also about that subject, because I think it’s intersting to notice that in 17th century indo-portuguese art, the image of the Good Sheppard reapers linked to the “Companhia de Jesus”. But there are differences between the images of the 5th century and the ones of 17th century: Jesus is represented as little boy and this works are small sculptures made with ivory. Interesting analysis, and something I hadn’t really thought about before. All four of those points seem relevant, and even just variations on the same theme – as the church became The Church, a stronger image was required. 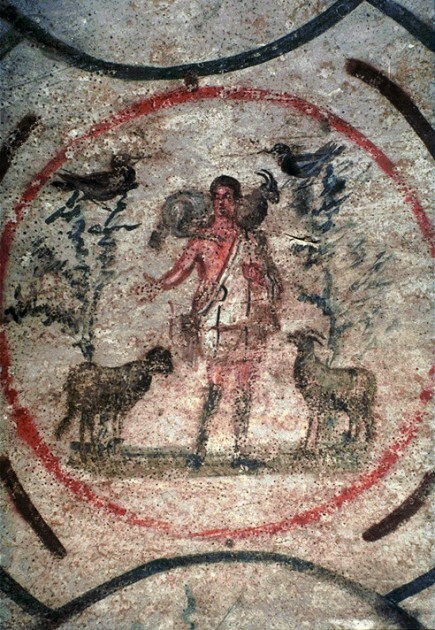 The examples you give of the Good Shepherd are both taken from catacombs, painted when Christians were still worshiping in secret. The image of a shepherd that could hold his dispersed flock together would have been more meaningful than it was to an organized church with extensive property. A beard was also added over time, which further enforces the idea of a stronger, more mature figurehead. I don’t know much about Marianism, but in a similar way to developing Christ’s image, the Church developed Mary’s imagery to suit developing theology and ideology. Thanks for the comments, Val and Francis! Val, if you are interested in learning a little bit about depictions of Mary (especially in contrast with Eve), I’d recommend reading “Eve and Mary: Conflicting Images of Medieval Woman” by Henry Kraus (PDF available HERE). Kraus talks a little bit about how the imagery for Mary evolved over time. Frank, I’ve been thinking about Emile Male quite a bit this week, as I’ve looked for some student reading assignments on medieval art. Thanks for including his quote. 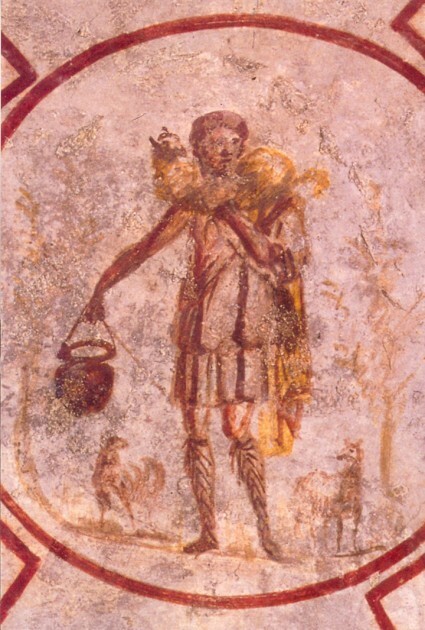 It is interesting to consider how certain stories and images were popular at different points in Christianity, even beyond the Good Shepherd imagery. Margarida, thanks for your comment! I have never seen these Indo-Portuguese examples before. How interesting that they were popular in the 17th century! I wonder if there is a cultural reason for why this imagery became popular at that time. The Indo-Portuguese iconography is a bit different from the early Christian examples. I noticed in your links that Christ is seated and rests his hand in his palm, while also holding a lamb in his lap. In contrast, the early Christians often depict a standing Christ with a lamb draped over his shoulders. I wonder if there is a historical precedent or explanation for the specific Indo-Portuguese iconography? It would be fun to research this topic more. Thanks for the link! I read a book, it is in Portuguese, where the author says that this iconography has influence from the budhist religion, for example in the way Christ is seated, with his eyes closed, with a hand pointing his forehead. 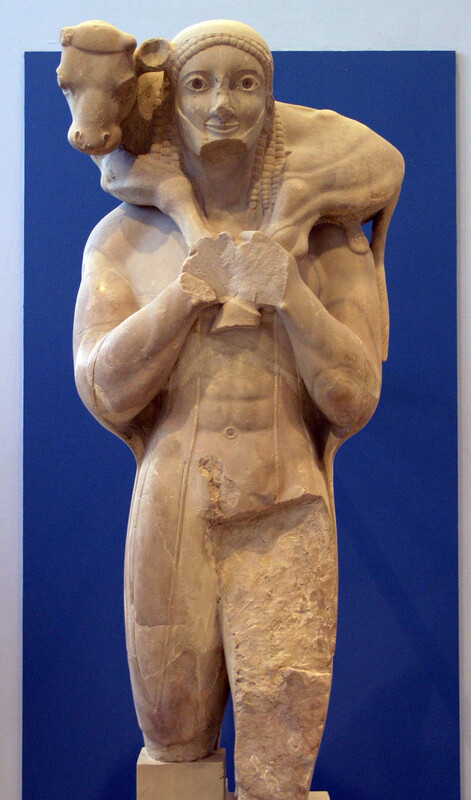 On another hand, sometimes the lamb is on his shoulder. The iconography of this sculptures is very interesting because sometimes Christ is over a small mountain where there is a sculpture of Saint Mary Magdalene and of the Fountain of Life. I also find this subject very interesting and I would like to learn more about it. Very interesting, Margarida! Obrigada pelo seu comentário. I will have to study this subject more. I suppose the Buddhist influence makes sense, due to the colonial expansion of the Portuguese during the 17th century. Interessante!